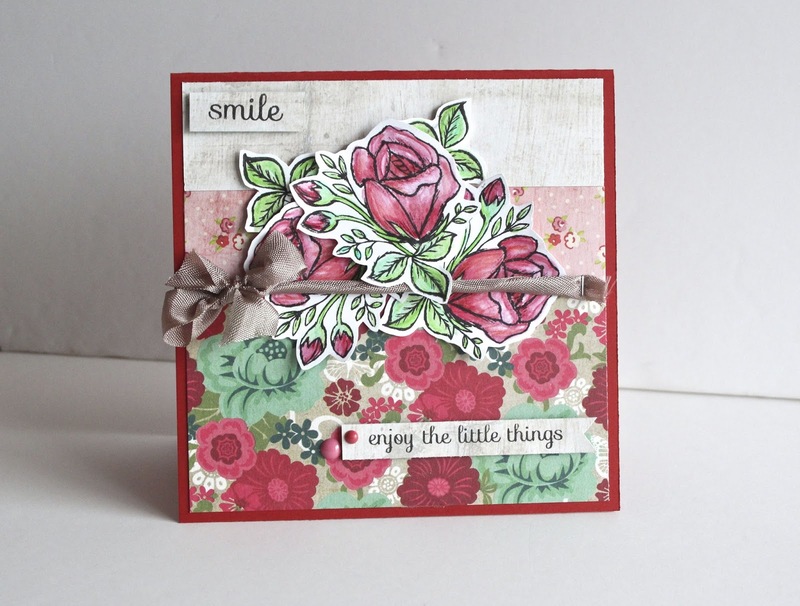 The Rubber Cafe Design Team Blog: SMILE - featuring "Vintage Findings"
SMILE - featuring "Vintage Findings"
Echo Park paper pad. Each month when I create with the kit, I line my cards in a row and let my 10 year old son decide which I should post first. He chose this as the first one, but the next one, he says, is his favorite. You will have to check back next week for that. However, this one is MY favorite. I could make all different color roses and change the papers, oh my, I could go one forever! To replicate this card, you will need to cut a red base, 10 x 5, folding in half to create a 5 x 5 card. Cut a floral block 2 1/2 x 4 3/4, small pink floral 1 x 4 3/4 and white woodgrain 1 1/4 x 4 3/4. Apply to the front of the card as show. 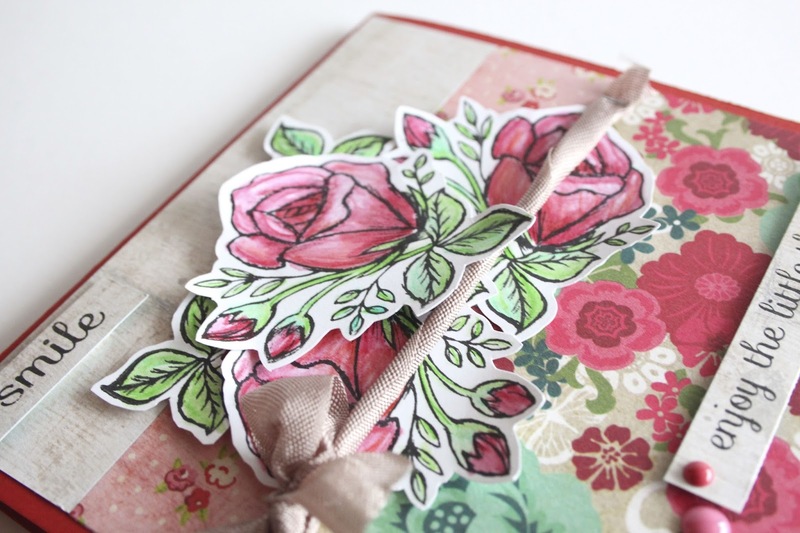 I have mentioned before, Melissa adds amazing cardstock to the kits. The quality is superior to most. If you are going to fussy cut small details, I recommend using a thinner, easier to manipulate piece of white paper. For this stamp, it is not to intricate around the edges, s oI was able to use what was provided. 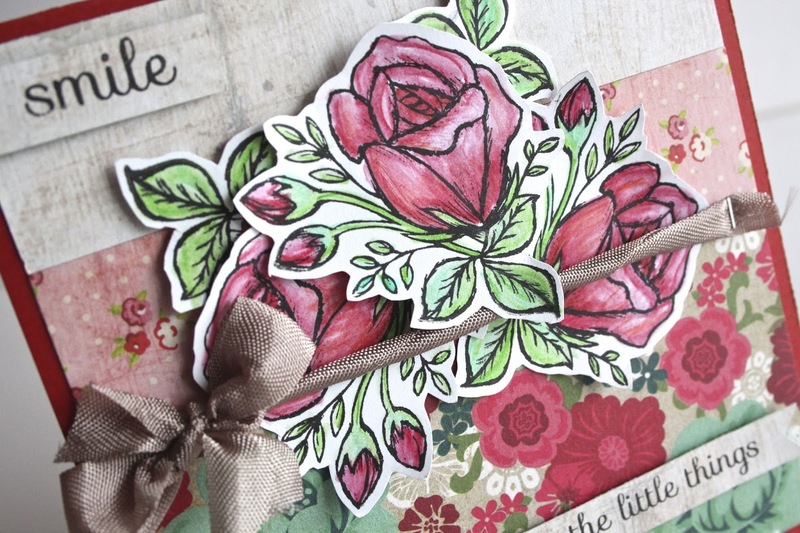 I stamped the rose stamp, three times. Colored each one with watercolor pencils and blender pen. You could use Copics, Watercolors, Pencils, or what ever is on hand. Once colored, I cut them out with fine tip scissors. Placed the bottom two directly down on the card. I twisted and stamped the champaign colored ribbon and staples on each end. Tied a pretty bow to the left. I then added my last rose, backed with foam slightly overlapping the ribbon. I stamped my sentiments on the scrap piece of white woodgrain, backed them with foam and added two enamels near the bottom sentiment. I can imagine the same card created with yellow roses using the yellow papers included in the paper pad. I hope that you have been inspired. Be sure to check back daily for inspiration, but for sure, come back next week, to see my sons favorite.